Figure 2-14. - Nonmetalic Restorations. (MFD) restoration; tooth #25, a mesial-incisal-lingual (MIL) restoration; and tooth #24, a distal-incisal- lingual (DIL) restoration. Porcelain, Acrylic Resin, Glass Ionomer, Artificial Crowns, Facings, and Pontics: Chart these nonmetallic restorations by outlining all aspects of the crown or facing as shown on tooth #27 in figure 2-14. In the "Remarks" section, indicate the material used. horizontal lines within the outline. If made of an alloy other than gold (chrome), the same charting applies. 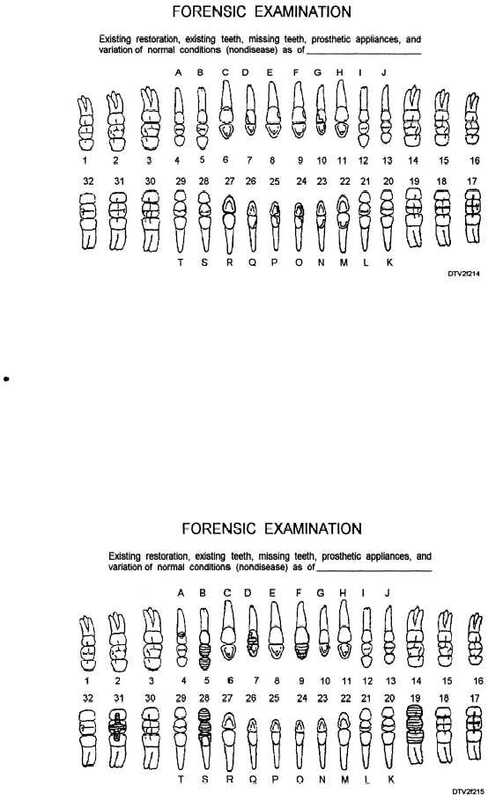 Indicate in "Remarks" section on the Forensic Exam form the type crown and metal used. Figure 2-15 shows examples of gold restorations. Tooth #4 has a facial (F) gold restoration, tooth #7 has a (DIL) gold restoration, and tooth #31 has a (MODFL) gold restoration. Figure 2-15. - Gold restorations and crowns.